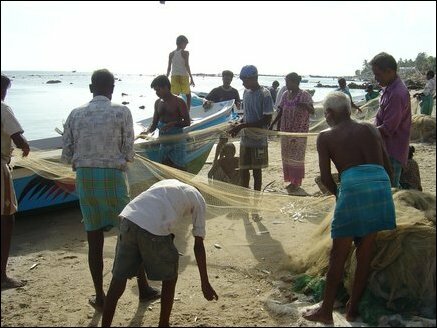 After the tsunami, Munai was the first fishing hamlet in Vadamaradchy area where fishermen resumed using mechanized boats. In other areas fishing is limited to the use of Catamarans (wooden drafts) and fishermen do not venture far out into the sea. 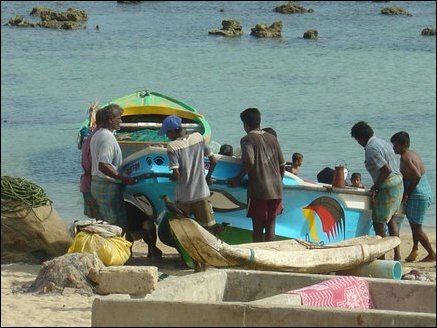 HUMEDICA, an organization for relief assistance, is providing boats to the fishermen. However many still need fishing nets and other fishing gear to restart their trade. Family members help in sorting the day's catch. "The fear of sea still lingers. But we are left with no other option. The ocean and we are inseparable" say the fishermen of this area. Children assist adults in sorting the fish in baskets. They then dip the basket and wash the fish in the sea. The days catch is then weighed in the shore. 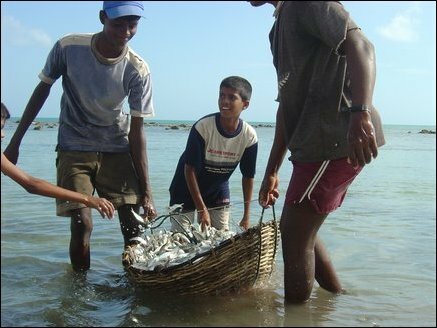 A sprat variety called 'Soodai' is the main catch in this area. 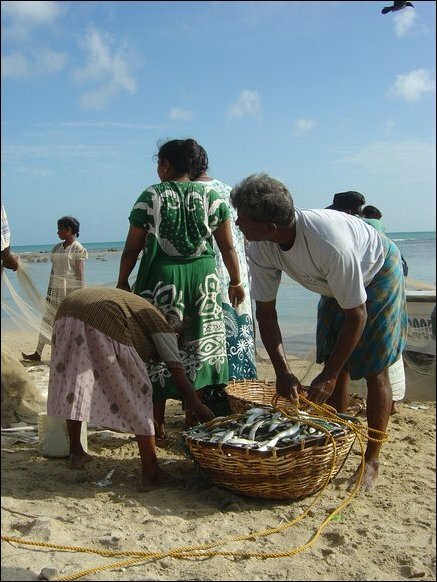 Vendors from Gurunagar purchase the fish for sale in Jaffna town. 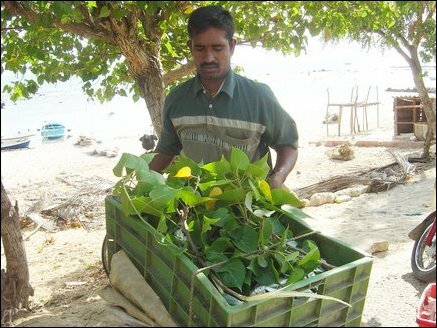 Mr. M. Donald, a vendor wrapping fish basket in Poovarasam leaves (a tree common in Jaffna Peninsula) for the motorcycle ride to Jaffna town. He purchases about 50kg of fish daily from this area. The Poovarasam leaf when rolled serves as a wind-intrument which the vendors blow to attract buyers. We meet Mr. Nobert, a fisherman turned fish vendor. "We see pre-Tsunami buoyance in market for fish reappearing," says Nobert. 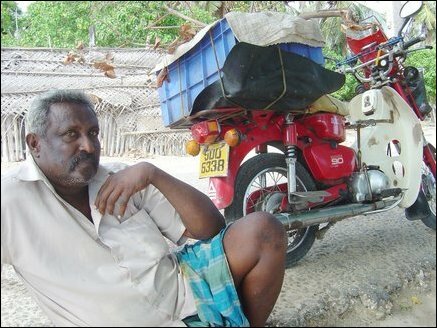 The Soodai fish purchased for Rs.35 at PointPedro fetches between Rs.40-60 in Jaffna market, according to Nobert. 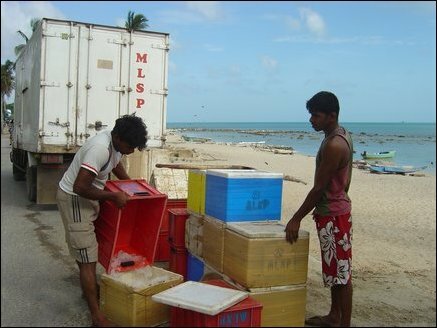 About 500 vehicles with deep freezer facilities are genrally seen parked in Vadamaradchi coastal area. These vehicles belong to wholesale Colombo businesses. They take large share of daily catch to Colombo. 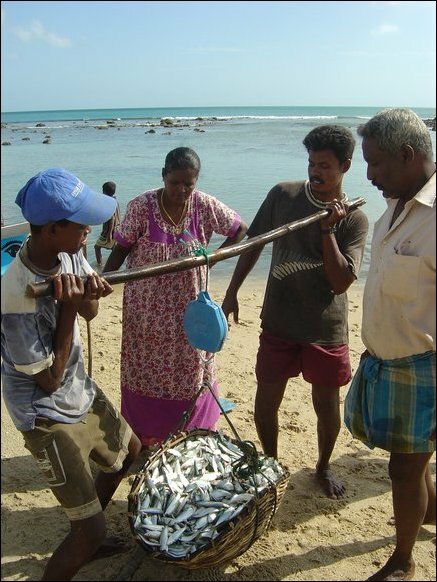 "Demand from outside Jaffna has had a healthy impact on the fish prices for us" say Donald and Nobert. 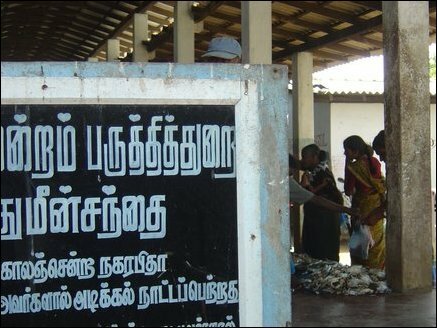 The fish market located 600m from Munai is one of the well known markets in Vadamaradchi. 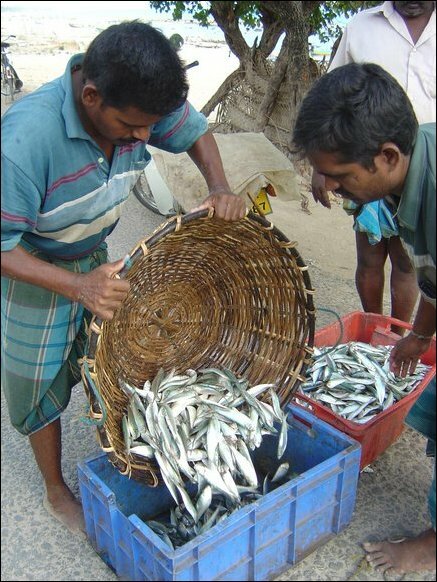 Since large portion of daily catch is taken to Colombo, local residents have to grapple with increasing prices. Mr. Nanthakumar says that on an average his daily catch is 300kg. 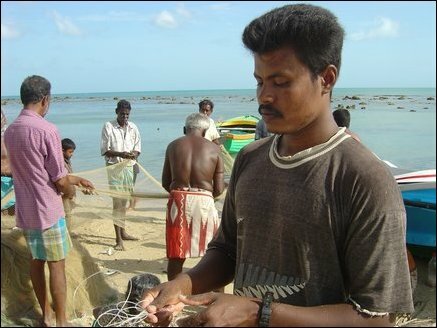 "But during pre-tsunami days we caught lot more; sometimes twice as much we catch now," he says.